In my ongoing quest to try all the food trucks currently tooling around the Triangle there was one truck that kept slipping through my fingers and my twitter feed: KoKyu BBQ. KoKyu, which is a Korean BBQ and fusion style food truck, tends to hang out at Motorco for Sunday Bloody Brunch, but I just hadn’t made it out to Durham on a Sunday recently. Luckily Ko Kyu has started venturing out more, and I was finally able to catch them at Motorco, along with Pie Pushers, The Parlour, The Grilled Cheese Bus and the nearby Sausage Wagon, on a food truck filled Friday night. 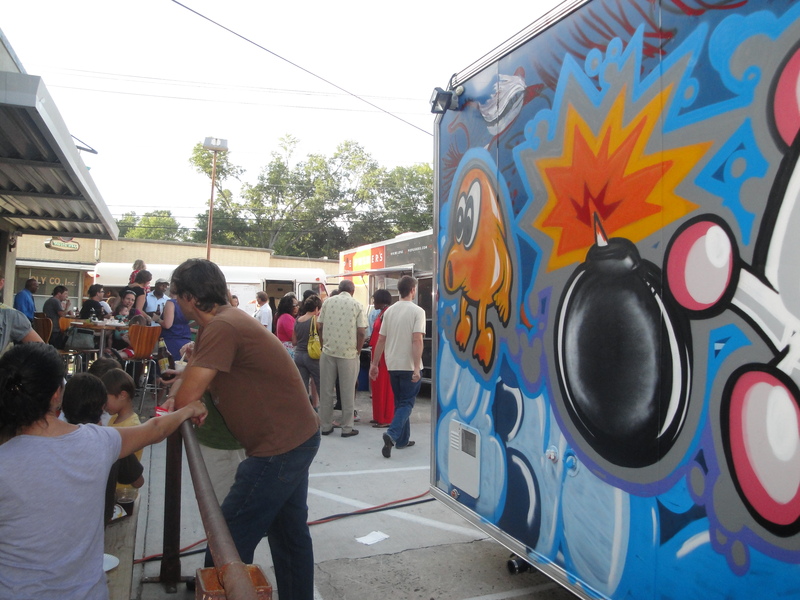 Jon and I meandered through the crowds and the food truck mass and headed straight to the spray-painted truck with the old-school Nintendo in the window. Look at that! So fun! The menu is well selected, with lots of different options including a few vegan/vegetarian choices. 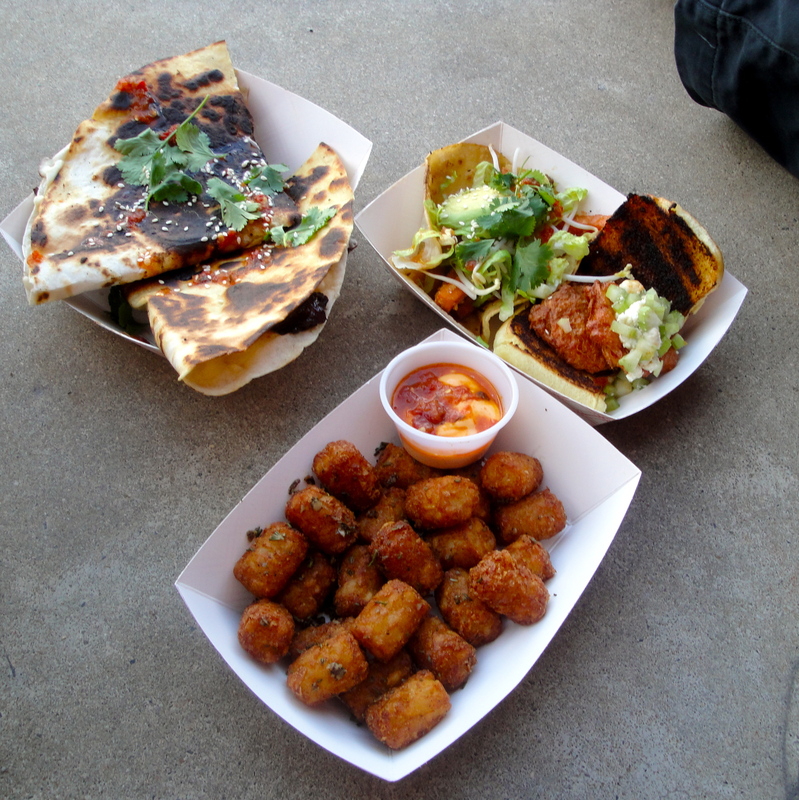 We decided to order a short-rib quesadilla, an “unreal” buffalo chicken slider, a sweet potato “tako” and some duck fat tots. We waited about ten minutes for our order and then took our food to a nearby patch of sidewalk. All the picnic tables outside of Motorco were taken, but it was a beautiful night out and we didn’t mind flooring it. I’ll start with the duck fat tots. So, basically, these are tater tots, but extra crispy tater tots because they were fried in duck fat, which is the perfect frying vehicle duh. They were dusted liberally with fresh, fragrant rosemary and came with a rooster (as in Sriracha) and mayo dipping sauce. These were really great. 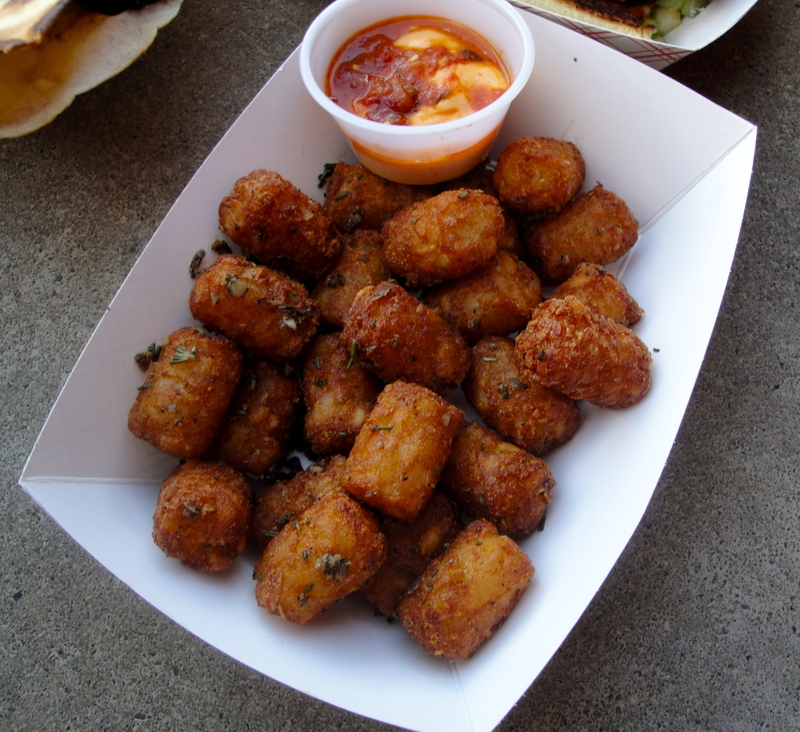 Tater tots are already a great thing, so just, times that by lots. The “unreal” buffalo chicken slider and the sweet potato “tako” were both the size of a snack-wich and packed tons of flavor. The sweet potato “tako” consisted of sweet potato and sweet potato fries, bean sprouts, avocado and tons of cilantro along with some Sriracha sauce, all in a soft taco shell. Tasty and fresh. The “unreal” buffalo chicken slider was also fantastic, tastier and more satisfying than the tako because, really, you can’t beat a buffalo chicken slider from a truck. However, the “chicken” is a soy patty–which I didn’t realize until scanning the menu later. It even tricked the tofu-hating Jon. The slider also had a lot of great flavors going: the tangy/sweet/spicy buffalo sauce, gorganzola cheese, some chopped celery for crunch, all on a soft bun. Last, and best, was the short rib quesadilla, which was such an awesome umami experience I can’t even describe it. Two giant, perfectly pan-crisped quesadilla pouches, filled with some kind of soft and tangy cheese, caramelized onions, and tons of tender, awesome short rib meat. This was great. This was so great that it inspired us to make quesadillas the following night, but that’s another post. Cilantro! Sriracha sauce! Leftover burning spicy sensation on the lips and tongue ( I know that sounds like an STD but it isn’t guys get over it). 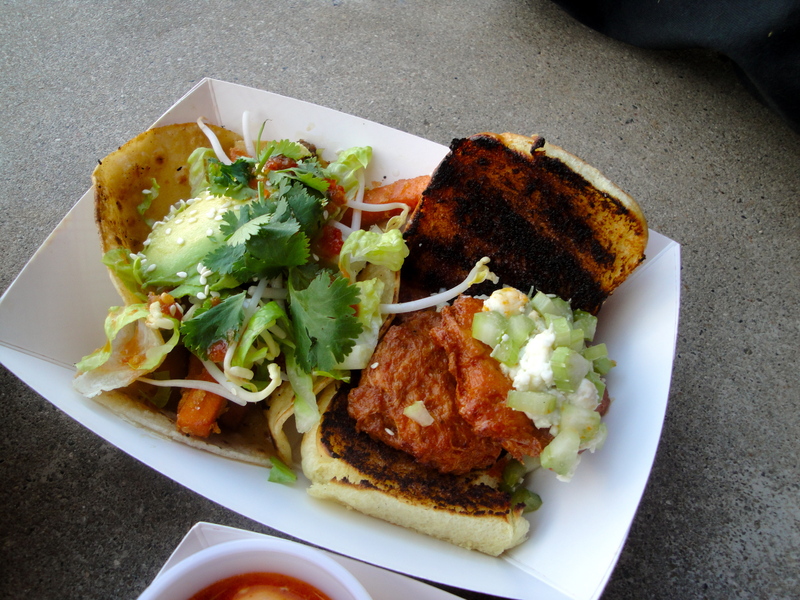 Ko Kyo is a Durham food truck treasure and I wish I hadn’t taken so long to try it! 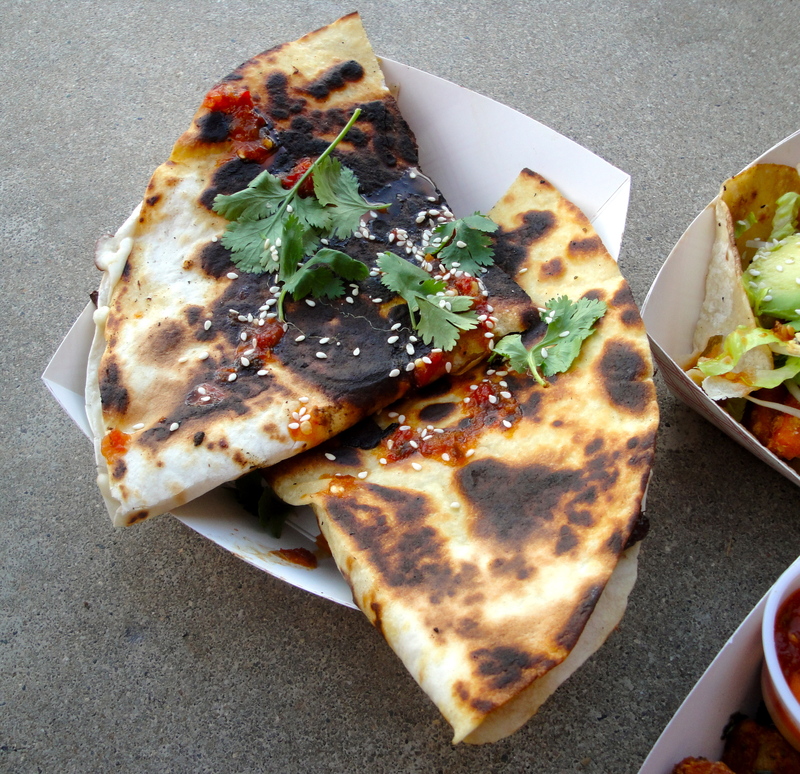 I can’t wait to get back to get me some BBQ/tako-y/Koreany fusion soon. You can follow KoKyu on their Facebook and Twitter feeds. 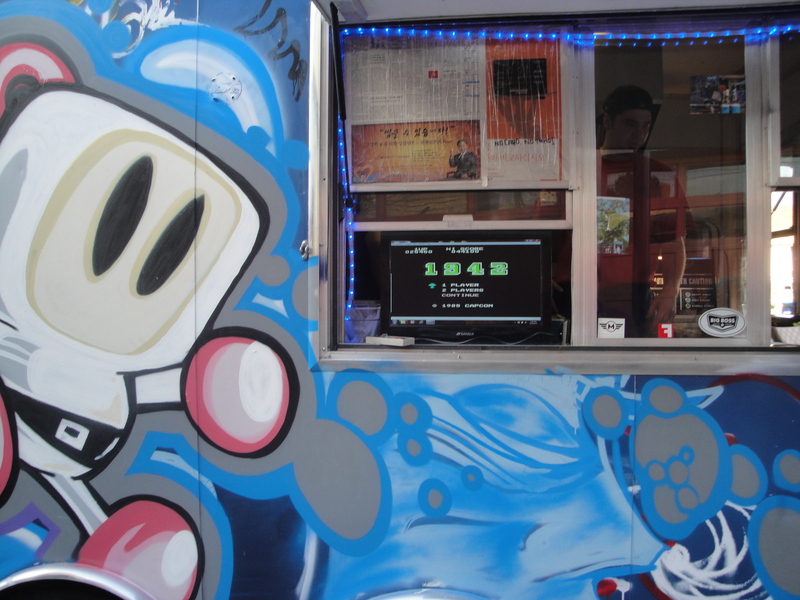 They don’t update their locations as much as some of the other trucks, but it is absolutely worth tracking these guys down and snagging some takos, tots, sliders and quesadillas. Also, they have this old-school Nintendo that you can play while waiting for your food! In my opinion this the best food truck in town not counting The Parlour, which is a bus, not a truck, and which serves ice cream and so it has its own category of fun. And yes, of course I had some Parlour ice cream as a palate cleanser. Who do you think I am?